The word “awesome” is very over-used these days and for many things that do not meet the definition of the word. 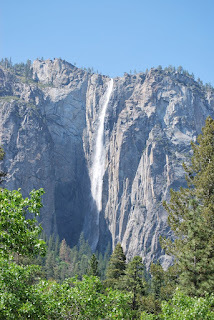 The waterfalls of Yosemite, however,definitely fulfills the meaning of the word as they are truly awesome. 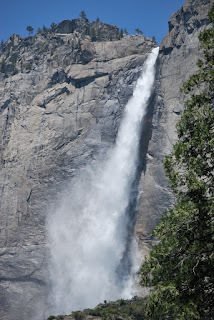 One of the things that makes the various falls at Yosemite so magnificent is that they are so fleeting in nature. While water continues to trickle throughout the latter part of the summer and fall, it is in late spring that the falls are going full force. The thunderous crashing of the water can be heard many places throughout the park, but it is in Yosemite Valley that the cacophony of sound can truly be heard. As you enter the Valley, you see your first glimpses of the falls…Bridalveil Fall to the right and Yosemite Falls to the left. There are other falls that you can see from the valley floor, but these two falls are the most spectacular. Yosemite Falls is actually divided into Upper, Middle, and Lower Yosemite Falls. Yosemite Falls is one of the world's tallest falls with the three falls measuring 1,430, 675, and 320 feet respectively. 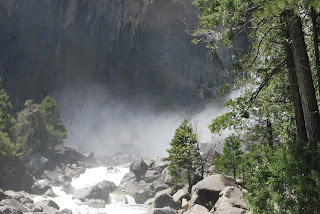 You can easily walk to Lower Yosemite Fall and get up close and personal with the thundering, icy waters. The mist hits you as you are about halfway up the short trail to the lower falls. Once you are on the bridge that crosses the stream fed by the falls, you are constantly doused with mist and larger splashes of water, depending on the nature of the winds. The pathways are clearly marked and there is excellent signage identifying which way to go for great views of the falls. 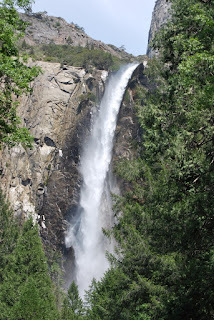 On the opposite side of the valley is Bridalveil Fall…a single fall of 620 feet. Bridalveil is narrower than Yosemite Falls, but still very impressive as its thundering water can be heard across the valley. You can also easily trek to the bottom of Bridalveil for a better view (the trail is short, but steep). I didn’t do this, having already walked to Lower Yosemite Fall. The parking lot that is nearby Bridalveil Fall affords a fantastic view through the trees. You can also stop along the valley floor and view Bridalveil without getting up close and personal. 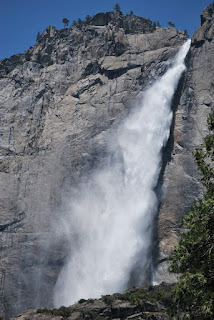 The falls at Yosemite go full force in late May and early June as the icy snows of winter melt. 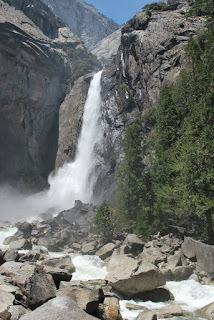 Throughout Yosemite, there are many falls you can view, depending on how adventurous you are. 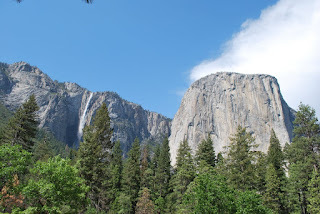 The majority of the falls can be accessed from Yosemite Valley. 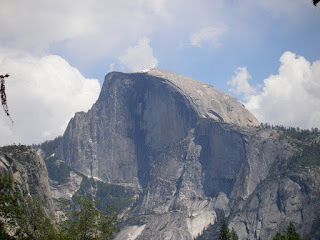 Yosemite Valley is also where you get spectacular views of El Capitan and Half Dome. There are various park-led tours you can take through the park if you don’t feel like driving yourself or hiking. There is a Yosemite Shuttle which will take to to various stops throughout the park, as well as the Yosemite Valley Floor open-top tour. 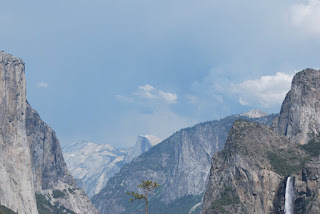 The cost to enter Yosemite National Park is $20 per passenger car and the fee is good for a week. 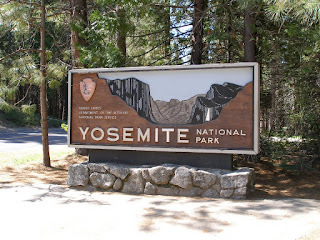 If you are interested in staying in Yosemite, make sure you book early, as reservations fill quickly for both hotel rooms and camping sites. There are a number of first-come-first-serve camping sites, but these are also filling up quickly these days.